During a recent Republican Party presidential candidate debate, Texas governor Rick Perry said, “In the state of Texas, if you come into our state and you kill one of our children, you kill a police officer, you’re involved with another crime and you kill one of our citizens, you will face the ultimate justice in the state of Texas, and that is you will be executed.” At the time of this comment, 234 inmates had received this “ultimate justice” in the state under his leadership. For Catholics, the Catechism provides the following direction: “the traditional teaching of the Church does not exclude recourse to the death penalty, if this is the only possible way of effectively defending human lives against the unjust aggressor. If, however, non-lethal means are sufficient to defend and protect people’s safety from the aggressor, authority will limit itself to such means. … Today, in fact, as a consequence of the possibilities which the state had for effectively preventing crime … the cases in which the execution of the offender is an absolute necessity ‘are very rare, if not practically non-existent’” (2267). Never are the words “ultimate justice” (or justice in any form) used in connection with executing someone in current Catholic teachings. This is only something done when necessary in extraordinary situations (unlikely to exist at in the United States—including Texas). Why? It’s simple: “Every human life, from the moment of conception until death, is sacred” (Catechism, 2319). But how many Catholics would side with Gov. Perry against the teachings of their Church? Surveys indicate most of them. 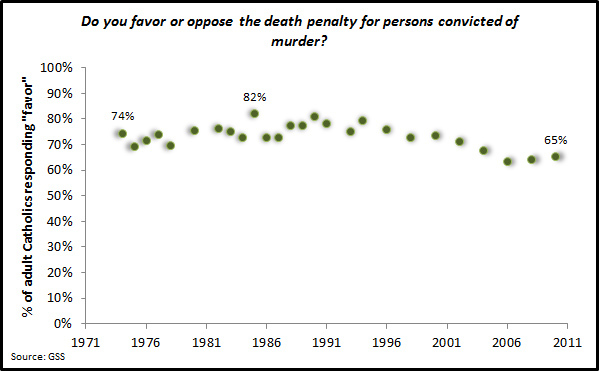 Although Catholic approval of the death penalty has dropped from its peak height of 82% in 1985, still two-thirds of Catholics (65%) supported the policy in 2010. But what of Catholicism and the pro-life movement? It is true that recent polls have indicated that a growing majority of Catholics consider themselves to be pro-life, however, many don’t seem to include the death penalty as an issue under this umbrella—even when it clearly is in the teachings of the Church (see Catechism, 2258-2330). 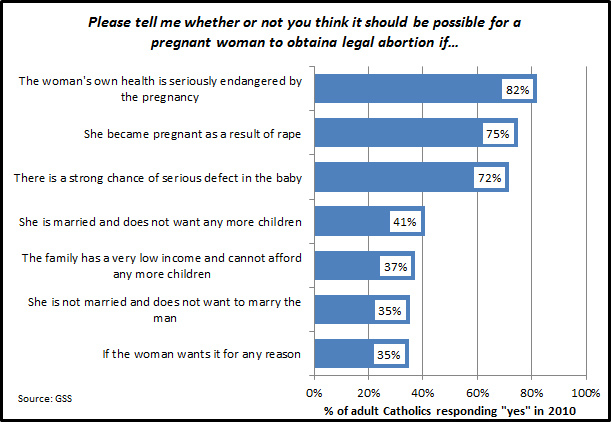 In 2010, about two-thirds of Catholics (65%) expressed opinions that were consistent with the Church’s opposition to abortion “on demand.” In addition to opposition to abortion for “any reason,” majorities of Catholics also oppose abortion in cases where the reason given is: not wanting any more children, low income or inability to afford more children, or the absence of marriage. There are even more wrinkles. 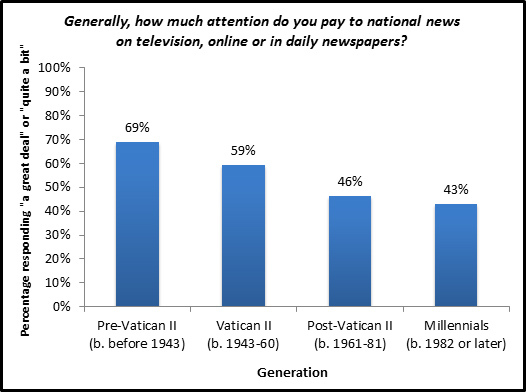 Add euthanasia into the mix and you begin to question whether there really are any U.S. Catholics consistent with the Church on life issues. Nearly seven in ten U.S. Catholics (68%) supported physician assisted suicide for patients with terminal illnesses in 2010. 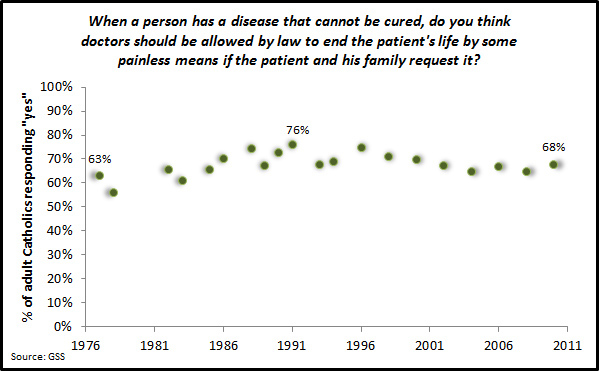 The Church of course teaches that euthanasia is “morally unacceptable” (Catechism, 2277). How many Catholics are consistent on all three life issues? The structure of survey questions make it difficult to come to a precise estimate. 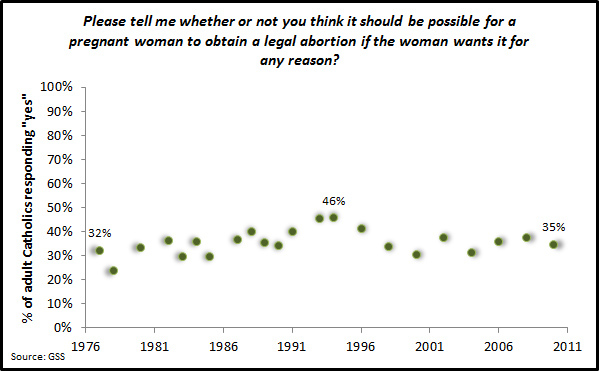 However, as an example, just more than one in ten U.S. adult Catholics oppose: 1) abortion if there is a strong chance of a birth defect for the child, 2) capital punishment for convicted murders, and 3) euthanasia for terminally ill patients who request this. Most express at least one attitude that is in conflict with Church teachings. The largest conflicted group among Catholic adults includes those who oppose abortion on demand yet support the death penalty (about four in ten U.S. adult Catholics during the last decade and specifically in 2010; only about one in ten support abortion on demand and oppose the death penalty). Here there is a split identity—in one instance mostly consistent with Rome and in another more in line with American culture and history. 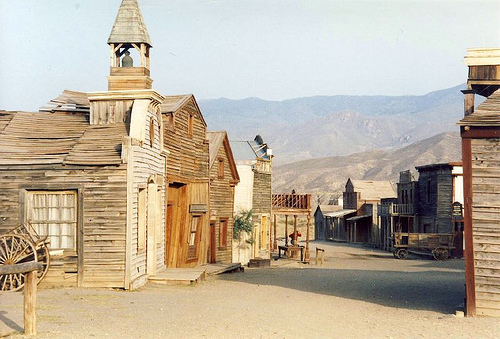 You might call it a “Spaghetti Western-style” pro-life identity—a uniquely American re-invention of Church teachings with a bit of the old west thrown in. In America, many appear to put matters of guilt and innocence above the overall sanctity of life and believe that they can be faithful and support the execution of a “bad guy.” These sentiments may be an important part of the explanation for how the U.S. is one of the few democratic capitalist nations with a Christian majority population that still allows for and uses the death penalty for civilians (e.g., the others are Botswana and Uganda). Above photo courtesy of nicksarebi at Flickr Creative Commons. What could churches do today? 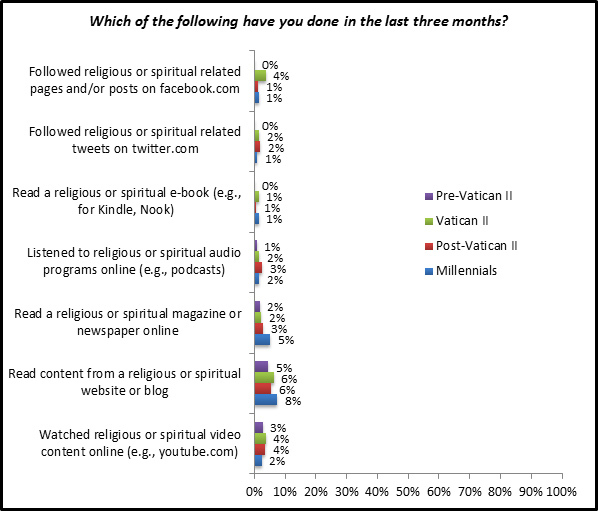 What could Catholic parishes do more specifically? In the ongoing debates about the federal budget it is not unusual to see someone propose significant reductions or even an end to federal social welfare programs and that the country should instead rely on American churches and charities to fill the gap and help the needy and seniors. In the Catholic blogosphere, similar arguments often include a reference to the principle of subsidiarity in an effort to engage the social teachings of the faith. The Catechism does note that, “The teaching of the Church has elaborated the principle of subsidiarity, according to which ‘a community of a higher order should not interfere in the internal life of a community of a lower order, depriving the latter of its functions, but rather should support it in case of need and help to co-ordinate its activity with the activities of the rest of society, always with a view to the common good.’ ... The principle of subsidiarity is opposed to all forms of collectivism. It sets limits for state intervention” (1883, 1885). However, this principle is limited to situations in which the local unit or community is able to address the problem(s) it is faced with (e.g., poverty, hunger, senior care). Could Catholic parishes be a significant part of a more local solution in replacing many of the functions of federal programs that provide assistance and health care to the poor and seniors? Is this a bit fairytale or a possible reality? 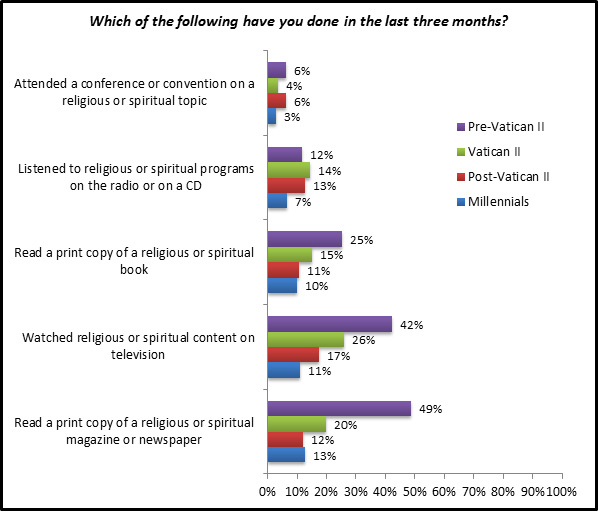 Data from a national survey of parishes for the Emerging Models of Pastoral Leadership project indicate that Catholic parishes in the United States have significant resources. For example, the average parish reports annual revenue of more than $695,000. Much of this, more than $477,000 per year on average, comes through weekly offertory collections from parishioners. However, the average parish has expenses of more than $626,000. This leaves little left over to deal with additional needs of the parish community that are not already being met in existing social assistance ministries and programs. Also, 30% of U.S. parishes indicate that their expenses exceed their revenue. Of those parishes reporting a deficit, the average size for the shortfall is 15.8% of revenue. Many of the parishes running deficits are in communities with some of the most dire economic conditions and therefore would have the most limited resources to respond to additional needs. At the root of the issue is Catholic giving. If Catholic parishes are expected to take on significant new social assistance obligations (e.g., helping replace Medicaid, Medicare, Social Security, food stamps) they would need significantly more in donations from parishioners than the current $9.57 given per registered household, per week (as estimated in the Emerging Models survey). Also, a strict adherence to the principle of subsidiarity would need some “elasticity” to allow for parishes within dioceses to cooperate so some of the parish collections from the wealthiest communities trickle over to parishes in communities facing higher levels of poverty and/or larger senior populations. In 2010, the federal government spent $68.3 billion on Supplemental Nutrition Assistance (i.e., “food stamps”) providing children and low-income people access to food. More than 18.6 million households received this benefit at some point in the year. In this same year, there were more than 77 million self-identified Catholics in the United States. CARA surveys estimate that about 68% of these Catholics attend Mass at least once a year and 56% are registered with a parish. Taking the larger of these two numbers, if we assume that 68% of Catholic households give an average of $9.57 every week to their parish (e.g., in pews, by mail, or electronically) this would result in a total weekly offertory nationally of more than $194 million from more than 20.3 million households. Assume this happens every week and you'd have a total of $10.1 billion for the year. That is an impressive total. But we know a full 68 percent of Catholic households are not giving this amount to their parish offertory every week and what is given is used to cover parish expenses which totaled an estimated $11.1 billion last year nationally (…the gap in offertory and costs is most often covered by other parish income from investments, other fundraising, and subsidies). But then again, many argue that a cut in spending and taxes would lead to a sudden increase in charitable giving (I don't know of any empirical evidence or historical examples that would lead one to estimate that this would be likely). Let's assume the extraordinary. What if Catholics increased their giving by a factor of five and the average household offertory contribution was $48 per week. Parishes would then have annual revenue of $50.6 billion leaving $39.5 billion “left over” after covering expenses to spend elsewhere. If all of this were used to address hunger in lieu of federal money, it could provide 58% of the 2010 budget for the Supplemental Nutrition Assistance program. That is impressive and parishes may be able to do more with this funding than a large national bureaucracy can. But that is just food stamps. There is nothing left over for parishes to assist in filling other gaps if Social Security, Medicare, and Medicaid also disappeared (all of which have budget numbers that make food stamps look like small change). More so this scenario still depends on the average Catholic being willing and able to give their parish nearly $50 per week! It all seems rather utopian when one looks at the real data. Catholic parishes and many other Catholic charities, hospitals, and ministries already do extraordinary work in helping the needy in the United States and abroad. I have no doubt they would find a way to do even more if government social welfare programs were cut. With more contributions from Catholics they would be even better able to do so. But could parishes fully replace even a single significant social welfare obligation of the federal government? No. Not even if Catholics start giving five times more in offertory collections. Some would likely respond that “social welfare programs have failed” because “there are still poor people” so we need to try something different (e.g., “let the churches take care of them”). My response to this always begins by noting that the policy and practice of the U.S. government (more specifically the Federal Reserve) is to maintain, at a minimum, 3% to 4% unemployment (i.e., NAIRU – the non-accelerating inflation rate of unemployment as lower levels of unemployment are thought to create inflationary pressures). When such a policy exists you will always have millions unemployed and they will be poor (the OECD estimates that NAIRU is actually about 5% to 6% in the U.S.). Second, when health insurance is so closely tied to employment and people get seriously ill and can no longer work… they lose the things they need most (an income and their insurance). 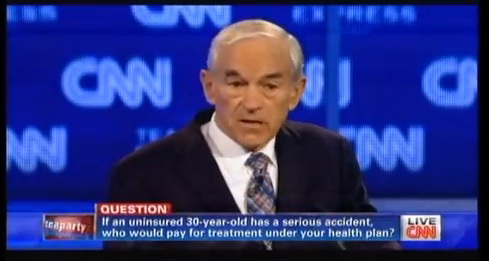 Poverty will exist as long as you have people unable to afford essential medical care. Third, there comes a point when we reach an age where it is challenging to earn an income for ourselves. To the degree that we do not take adequate care of our oldest citizens—providing at least a basic standard of living and healthcare while acknowledging they may be unable to contribute to this at their age, there will always be poverty in America. Catholic institutions have done, are doing, and will continue to do an enormous amount with what they have to combat poverty. But it is a quaint myth that the churches, or Catholic parishes more specifically, could somehow do all that is needed in 21st Century America to provide assistance to the poor and elderly if government programs were significantly cut or disappeared.